Want an easy, tasty, family friendly summer meal that can be made ahead of time? Look no further because this recipe has it all. This is one of our favorite summer meals (well any time of year meal). Its chock full of flavor and can be served up in so many ways that you’ll never get bored. Top it on some mixed greens or basmati rice, throw it in a whole grain tortilla or serve it between your favorite sandwich bread. The possibilities are endless. This salad is also great to bring to a potluck picnic. My friend Yvonne brought it to our 4th of July pool party and we served it up on some whole-grain tortillas and paired with my lacinato kale salad. It was such an easy and healthy potluck dinner, as everything was made ahead of time. 2 cups red seedless grapes, halved – You can also substitute 1 cup of chopped mango for a cup of grapes. I always do this when mangos are in season. Below are the ingredients you will need (you just need 1 more cup of grapes, as I forgot to add that below). 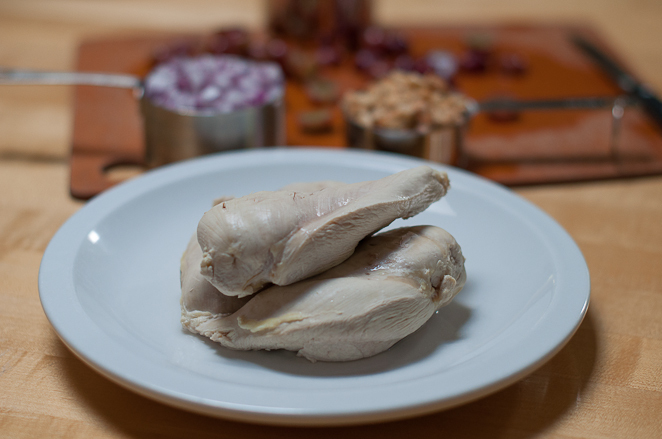 Prep all of your ingredients while your chicken is simmering, and then you will be ready to go. In a 2-to-3-quart saucepan, bring 4 cups of water along with the 1 3/4 cups chicken broth to a simmer at medium-high heat. Note: When simmering, bubbles will break the surface slowly, mostly around the edges of the pot. Once the water is simmering, add the chicken and simmer, uncovered, for 6 minutes. I kept my heat at medium-high here because once you add the chicken the water cools down a bit. Remove pan from heat and cover, then let stand until chicken is cooked through, about 15-20 minutes, or more. You may get 2 large breasts that are 1 1/2 pounds or 3 small ones, so the cooking time will vary depending on the size of your chicken breasts. Make sure your chicken is cooked through; sometimes it takes less than 15 minutes for my chicken to cook or sometimes it takes more. I just pull the chicken out and test it with a meat thermometer. You want the chicken to be at 165 degrees, as there is nothing worse than undercooked chicken, YUCK! Transfer cooked chicken to a plate and let it cool for 10 minutes or so. Once the chicken is cool, chop it into 1/2 inch pieces. 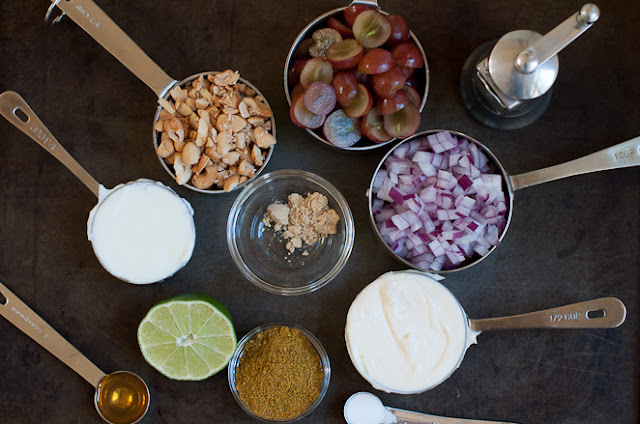 Add the chicken, red onion, grapes and cashews and stir gently to combine. Cover and refrigerate the chicken salad till needed. 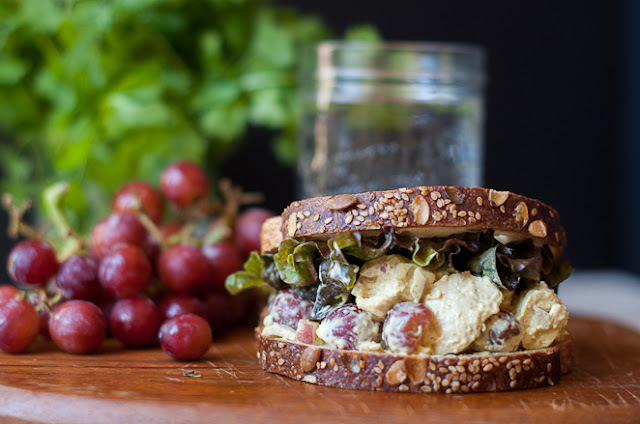 Serve this up as a sandwich on your favorite bread or on a grilled whole-grain tortilla. We love this served up over some basmati rice in the winter. Feel free to substitute apples when grapes are out of season. 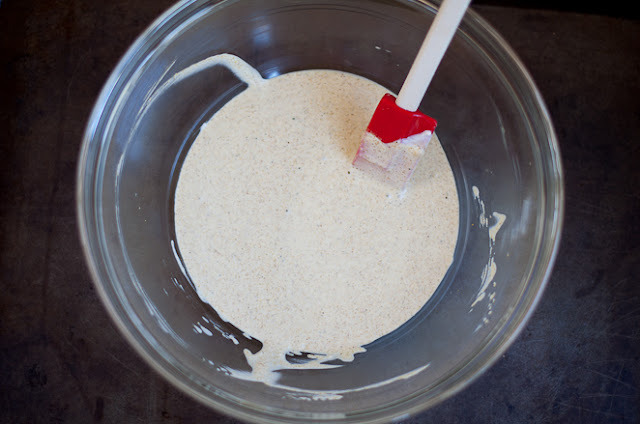 You can also use walnuts or almonds in lieu of cashews or omit the nuts and add some celery. Seriously, you can add and mix in whatever you like. Curry is known to be good for you, so do something good for yourself and make this salad! Better late than never! I made this for two families that were visiting in September. I wanted to have something on hand for last minute lunches and this didn’t disappoint! Grapes were still in season and I loved the crunch it gave to this very adult, indulgent dish. love grapes in salads and in unexpected places – so crunchy and fresh! mmmmm. i’ve never tried something like this before! sounds so savory and refreshing! SO funny that you mention mango, as the original recipe called for 1 cup of mango. We just substituted an extra cup of grapes in for the mango as Zoe is not a mango fan. You got it down girl, you little culinary expert! These photos are the last photos I have taken in over a week. I have been so busy that I have not had time to make anything new nor take any photos. I’m seriously in summer slacker mode! Wow, this looks delicious. I love curried-salad-anything, and the little sweet bites of grape paired with it sounds awesome. Definitely making this soon! 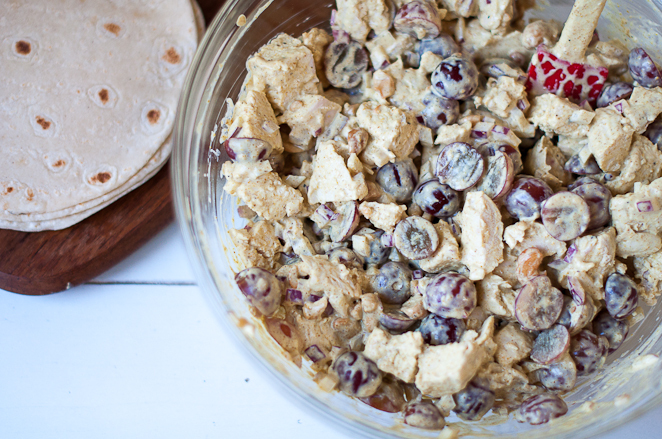 Your curried chicken salad is very interesting…because you have added grapes in it. I usually associate grapes with sweets and find them very different eating with savoury. I see that you are applying some of tips that you learn in your recent professional photography course. Your pictures in either black and white does give a different look to your delicious sandwiches. Hi Zoe. The grapes actually add a nice crunch to the salad and a sweetness but they are not too sweet so it’s a nice compliment. The original recipe called for 1 cup grapes and 1 cup mango, so it was a bit sweeter with the mango. Our Zoe is not a mango fan, so we omitted that ingredient. Thanks for the sweet compliment regarding the photos. I couldn’t decide if I liked the black or white background better, so I used both in this post. The black does make the sandwich stand out more, but the white makes it look more summertime. 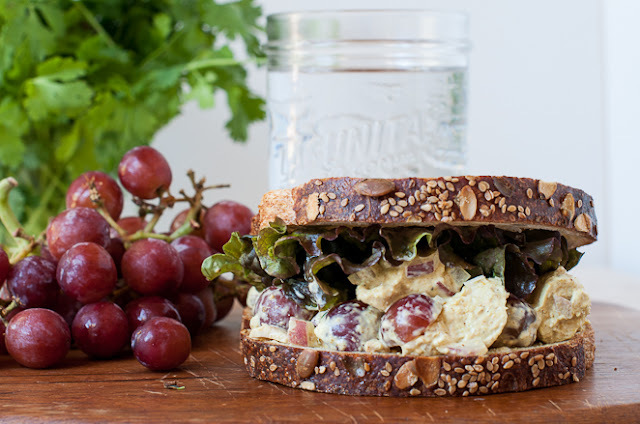 I have a sudden craving for a chicken salad sandwich… this looks amazing! Another yummy recipe! I’m not a huge fan of mayo but this looks really tasty. I love the photos you took as well!